In one sense, Marie Antoinette has been used in advertising since her ascendant as the pivotal star of Versailles–fashion plates and even dolls bearing her likeness were not just demonstrations of the sumptuousness of the crown’s wealth or a record of the Queen’s appearance, but a figurative, flashing “Buy Me!” sign to all of the fashionable ladies who could afford to aspire to their sovereign’s wardrobe choices. By the time of the queen’s death in 1793, however, her status as a walking billboard for the pricey marchande de modes had long since ended. But her death has not stopped her–or her story–from being used in advertisements that market everything from Victorian-era medicines to chocolates and even highlighter pens. 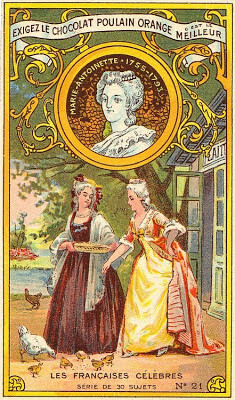 Marie Antoinette, like many historical figures, featured heavily on many 19th and 20th century advertisement cards. These cards were usually either printed as postcards or trading cards–both a potential way to advertise their product to the masses. Not surprisingly, Marie Antoinette is often found in advertisements for sweets, such as chocolates.